In summer it is best to water your lawn either early in the morning or early evening, since evaporation is unlikely at those times. Apart from temperature, soil type also plays a role: sandy areas will require more (and more regular) watering because of quicker draining, whereas clay or mixed soils will need less – adjust for the type. It may be a good thing to remember that over-watering during dry spells may be bad for your lawn, since roots stay alive much longer than we realize. So, even if the lawn appears slightly brown/yellow, it does not mean that the roots have died. It is better to water heavily at infrequent times as opposed to frequent watering only on the surface. A tip is to keep all garden areas as clean as possible in order to prevent pests from hiding. Get rid of all twigs, lawn cuttings, dry leaves and even small rocks underneath which pests can hide. Add these unwanted pieces of debris to your compost heap. Trim bushes; never allow the lawn to become ‘’wild’’. Birds are not only beautiful in our gardens – they help control pests. Have enough water for them near your lawn, feed them some seeds, but be careful not to scatter the seeds too wide, since that can invite those pests onto your lawn! The healthy lawn is fed good sources of nitrogen; especially slow-release varieties to ensure a much greener, dense look. Keep in mind the type of soil and grass you have before you decide on your fertiliser. The best time to fertilise is late winter/early spring in order to stimulate growth. Consider organic products as they’re safer for kids and pets. The moment you have weeds, act! Do not wait until you have a major problem. Get rid quickly of the lawn daisy and clovers. Look out for moss, esp. in shady, moist areas. If left too long, moss can invade and kill your lawn. Most nurseries offer a variety of products to choose from. Be careful not to over-mow; it can take a long time to bring your lawn back to its previous best. Make sure you use sharp blades that cut cleanly, but be careful not to mow too short. Most gardeners will tell you that once a week, regularly, is advisable for most lawns since you will stimulate growth and detect pests quicker, as opposed to leaving it for too long. You want to round of your lawn nicely after you’ve done the mowing. Trim the edges back. 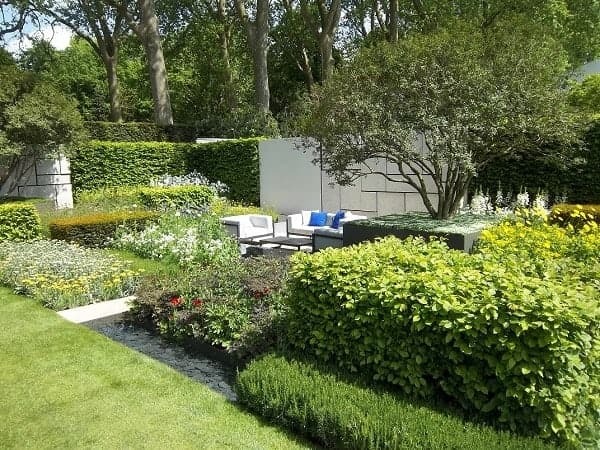 Most of us will find that edging shears work well; otherwise line trimmers are the answer. Lawn thatch consists of debris such as clippings, roots and stems that gather just below the grass line where it meets the soil. You need to de-thatch this unwanted substance to prevent your lawn from suffering bad air supply and water not reaching the growth points. High traffic areas on your lawn (kids and pets at play) may suffer from bald patches. Most nurseries sell blends to help fill those areas, strengthening root systems and encouraging new growth. In severe cases it may be necessary to re-seed during autumn. It is an easy process: simply prick the bad area with a garden fork and rake the soil to create a fine bed. Now scatter grass seed evenly and cover with a thin layer of moist compost. Water regularly. When uneven surfaces need smoothing out, or your lawn is in need of de-thatching or better drainage, top dressing may be your answer.